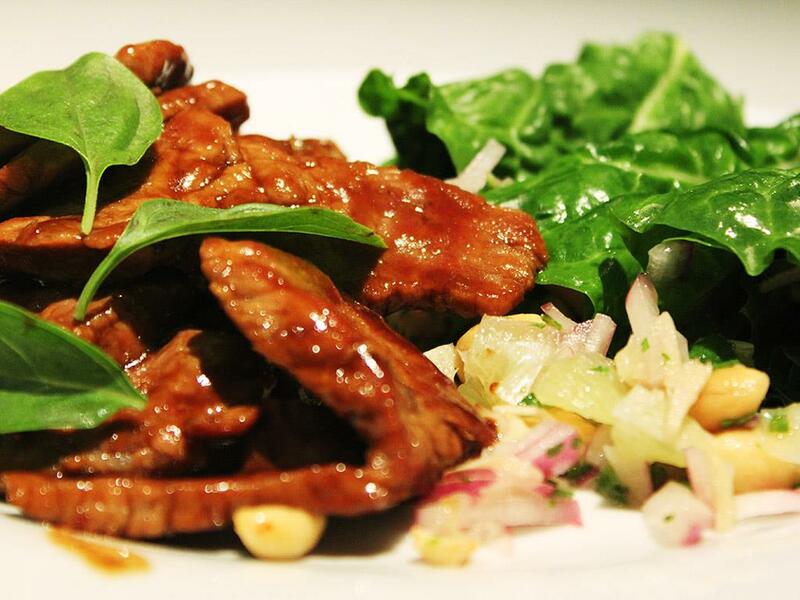 Sizzling strips of chilli flavoured beef stir fried in oyster sauce. Accompanied by an explosion of fresh flavour - limes, cashews, ginger, fresh coriander - wrapped in crunchy spinach leaves. Prepare all the ingredients per the instructions above. Peel the lime using a sharp knife (remove white pith too). Then dice the lime segments (5mm pieces). Cut the stalks off the Swiss Chard and slice into wide ribbons (5cm wide). In a large bowl, mix together limes, ginger, red onion, chilli, fresh coriander, peanuts, fish sauce and xylitol. Lay the Swiss Chard ribbons out on a cutting board. Place a tablespoonful of the mix on each, then roll up. Using a very sharp knife cut the steaks into THIN strips (5mm) against the grain: this means cutting across (and not parallel to) the long muscle fibres in the meat. NB: If you don’t have a big enough frying pan (or wok), then cook in batches - per instructions below. The strips should not overlap in the pan. Place a large frying pan (or wok) on high heat until smoking hot. Pour in the oil and swirl around the pan, then tip in beef strips in a single layer. Add the chilli. Stir fry for about 3 minutes – stirring all the time – until the meat is lightly browned. Now pour over the oyster sauce. Cook for just under a minute until the sauce is heated through. Stir in the basil leaves. Serve immediately. To serve, place the steak strips and spinach wraps on the plate.